Hubble photo of NGC 6814 shows magnificent spiral arms. I’ve seen (and posted) so many pictures of spiral galaxies that it takes a lot to really get me to say, “Wow”. The magnificent spiral galaxy NGC 6814. This image stopped me in my tracks. 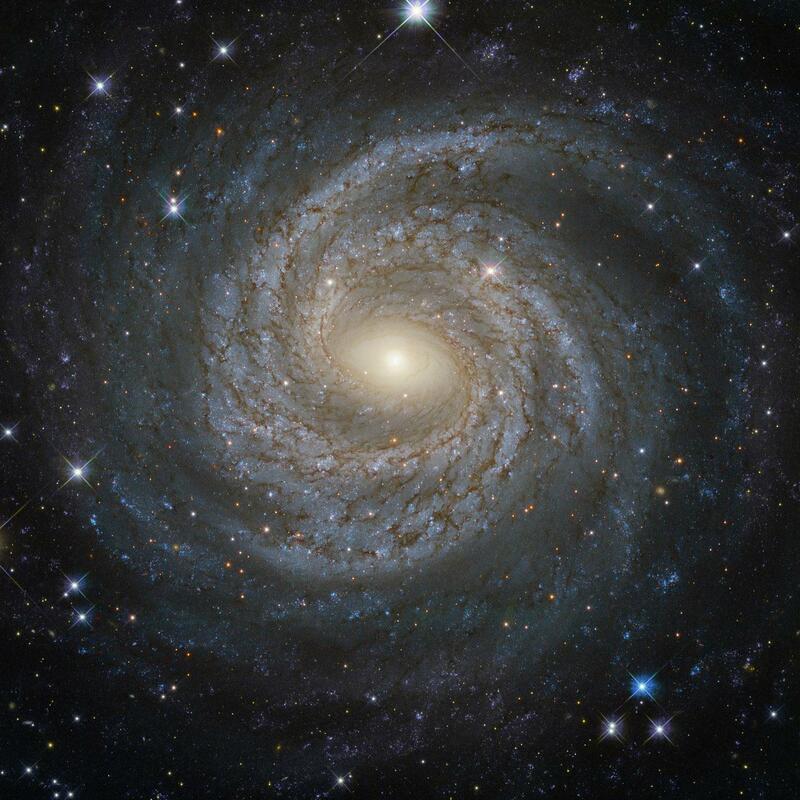 It’s NGC 6814, a large spiral galaxy about 75 million light years from Earth. It’s a hair smaller than our Milky Way, about 90,000 or so light years in diameter, and it’s a real beauty. This image was taken using Hubble Space Telescope, and it’s an unusual combination of colors. What’s displayed as blue is actually yellowish light at 555 nanometers wavelength; what looks green is actually 814 nm (very red, even near-infrared light), and what’s shown as red is actually 1.6 micron light, well out into the infrared. I find that interesting; it’s not what your eyes would see, but it does look very much like a natural-color photo of a spiral (I’ll add this image was processed by Judy Schmidt, whose work I’ve featured here on the blog many times). At first glance it seems pretty normal, if spectacular. A central bright nucleus, an elliptical hub of stars around it, and then those glorious spiral arms, looking cloudy blue from countless massive luminous stars. You can see a tinge of reddish-pink which is usually from gas clouds… but in this case that’s infrared light, so it’s probably from dust. And speaking of dust — grains of rocky, silicate material and long carbon-based molecules that are nothing so much as soot — you can see dark bands running through the arms where thick clouds of dust block the visible light from stars. And on top of all this is a smattering of stars inside our own galaxy; we live in the Milky Way, and have to peer out of it to see more distant galaxies. It’s like looking through a slightly dirty window to a scene outside. Still, there’s more going on here than you might guess. In the heart of this galaxy is a feeding monster. We know all big galaxies have huge black holes in their centers; they form at the same time as the galaxy and grow along with it. The one at the core of NGC 6814 isn’t all that big as they go, about 10 million times the mass of the Sun, or a little over twice the mass of the supermassive black hole in the Milky Way’s center. Our black hole is quiescent, though, inactive. Not so the beast in NGC 6814. It’s actively feeding, matter swirling around it at high speed. This disk is the last stop for any material falling down into the black hole; it piles up there and heats up hugely due mostly to friction. This makes the core of the galaxy unusually bright, and if you look you can see there is a bright knot of light at the very center. We call galaxies like this Seyfert galaxies. But there’s more. Elements heated in a gas cloud emit light at very specific colors, and these act like fingerprints or DNA samples, allowing us to determine what chemicals are in the gas. Oxygen, hydrogen, and carbon are commonly seen, along with many others. As the gas moves around the black hole, its light gets blue shifted as it heads toward us and red shifted when it heads away. The amount of shifting tells us how fast the gas is moving, and can also help determine the mass of the black hole. In this case, we see gas pretty far out from the black hole (the light isn’t shifted a lot) as well as gas very close in, which is moving much more rapidly, tens of thousands of kilometers per second. This affords astronomers an excellent view of what’s happening all around the black hole. We knew all this before this magnificent Hubble image was taken, though. These observations were actually made to measure the light output from very bright stars that are known to change their brightness, called Cepheid variables. They pulse, and the time it takes them to pulse is related to their total energy output. By timing these variations, and knowing how bright the stars appear, their actual energy output can be used to gauge their distance. That tells us how far away the galaxy is! So this is much, much more than just a (jaw-droppingly brain-staggeringly) pretty picture. This is a key to cosmos itself, a way to determine the size and scale of the Universe we live in. In astronomy, there’s never any such thing as just a pretty picture.